Leading Manufacturer of steel strapping roll and high strength steel strapping roll from Ahmedabad. By keeping track with latest market development, we are engaged in offering our clients a broad array of Steel Strapping Roll. This strap is designed by our professionals in compliance with defined industry standards using premium quality components as per the defined industry standards. We offer this strap as per the application requirements of the clients after thorough checking of each and every product on various predefined norms of the industry. 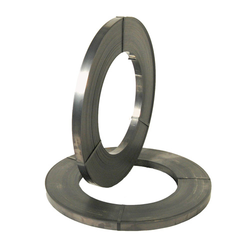 We feel proud to introduce ourselves as the leading organization of High Strength Steel StrappingRoll. Our team of professionals manufactures this strap using quality approved component keeping in mind set industry norms to ensure flawless at the users’ end. It is offered in different sizes and shapes. Our team of experts offers this product in various specifications that can also be customized as per information provided by our renowned clients.